The Smithwick Devil's Horse is a classic, prop-equipped, hand crafted wood lure. 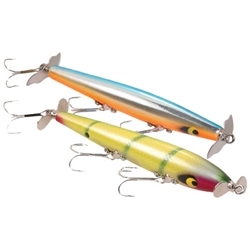 The unique buoyancy of wood combined with two carefully balanced, surface-churning propellers, duplicates the unique commotion of fleeing shad to produce rod-busting strikes from surface-feeding fish. The Devil's Horse is offered in two sizes: 100 Series- 4-1/2", 3/8oz, #5 hooks and the 200 Series- 4-1/2", 1/2oz, #3 hooks. Quantity Size 3/8oz 4-1/2" 1/2oz 4-1/2"